The calling card of a successful bowhunter is confidence. 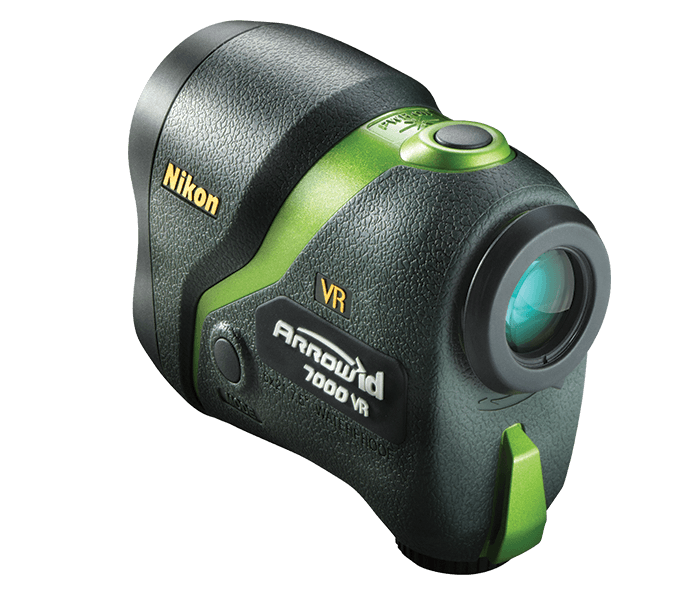 This season, become unshakable with the help of Nikon’s ARROW ID 7000 VR laser rangefinder. Separating it from all others is Nikon’s groundbreaking optical VR (Vibration Reduction) system, engineered to reduce vibrations of the image in the viewfinder caused by hand movements while simultaneously aligning the viewed image with the activated laser beam. The result is a rock-solid view of your target together with faster, more precise ranging. Wide field of view, long eye-relief and bright optics get you on target faster. The ARROW ID 7000 VR provides distance readings from 8-1000 yards. Readings are displayed in .1-yard increments and thanks to Nikon’s HYPER READ technology, the measured distance is displayed with a fast, stable response, regardless of how far you are from the target. Distance readings are accurate to +/-0.5 yards/meters when measuring less than 700 yards/meters and are accurate to +/- 1 yard/meter when measuring farther than 700 yards/meters. Choose between two different ranging modes depending on the situation. First target priority mode allows you to range an object as small as a fence post while distant target priority mode displays the range of the farthest target among a group of targets measured. Nikon’s advanced ID Technology provides the horizontal distance to the target, even when ranging at various incline or decline shooting angles—up to an incredible +/- 89 degrees (nearly vertical up or down).